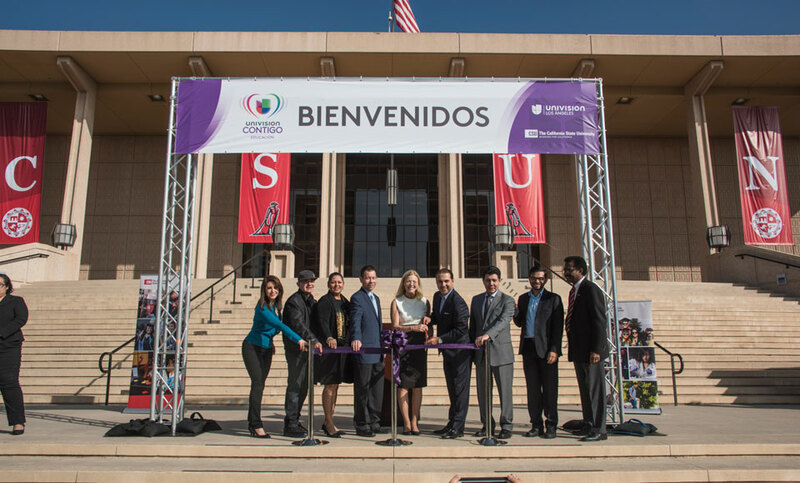 The ribbon-cutting ceremony signaled the start of the eighth annual Feria de Educación, hosted for the first time by CSUN. Photo by Lee Choo. 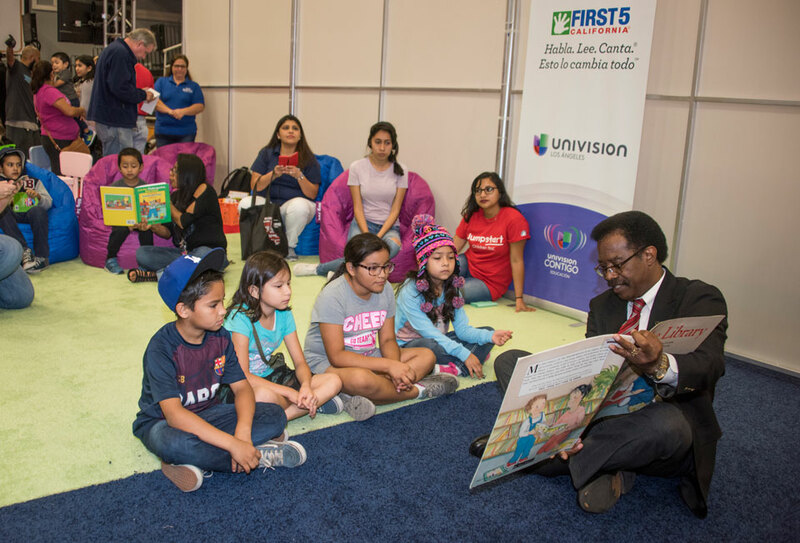 CSUN Vice President for Student Affairs and Dean of Students William Watkins read to young people during the event. Photo by Lee Choo. This youngster is learning about a future in STEM. Photo by David J. Hawkins. 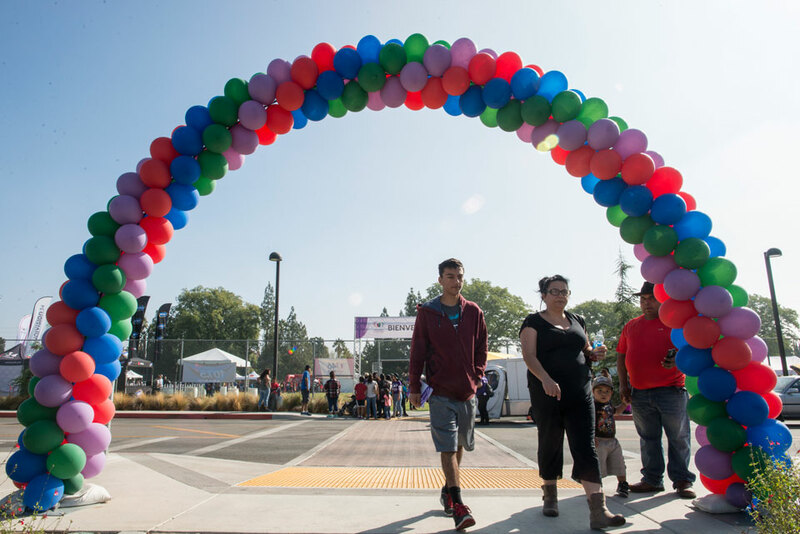 The balloon arch frames the entryway to the outdoor booths during Feria de Educación. Photo by David J. Hawkins. 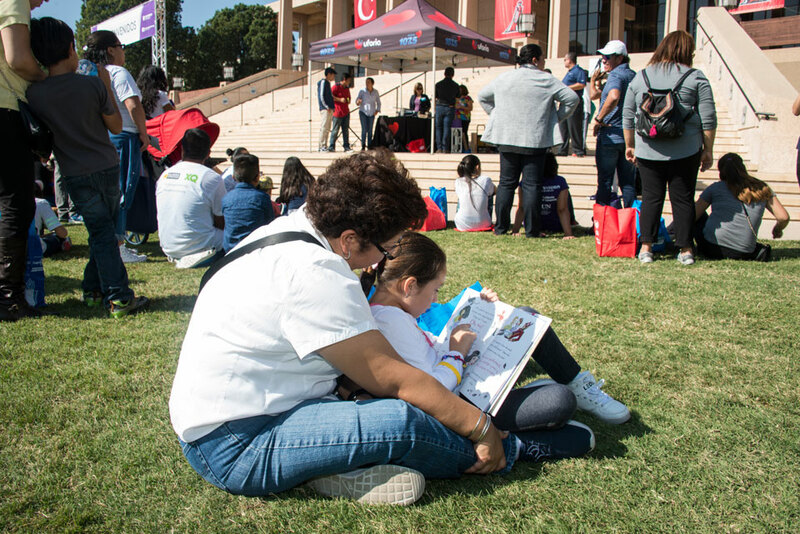 This mother and daughter picked a nice spot for some reading during the event. Photo by David J. Hawkins. 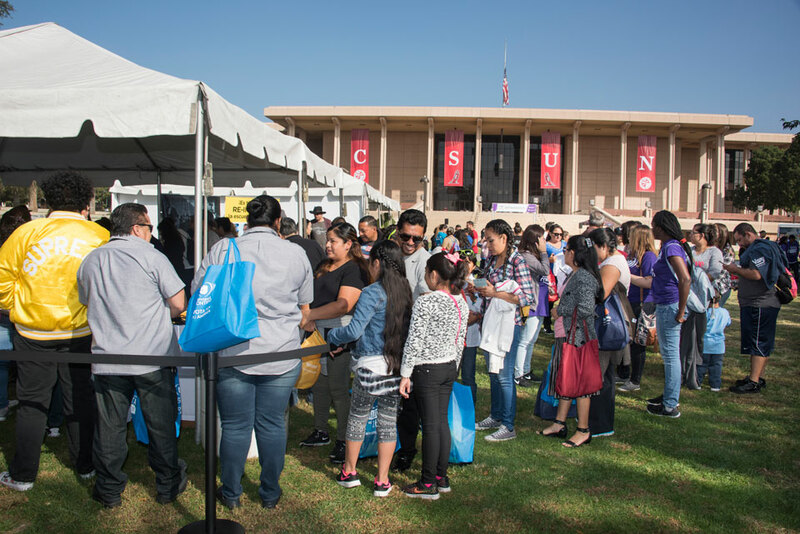 Thousands of people attended the Feria de Educación, which was hosted by CSUN for the first time. Photo by Lee Choo. The Matadome was the location for much activity during Feria de Educación. Photo by Lee Choo. Book distribution also took place inside The Matadome. Photo by Lee Choo. Authentic baile folklorico took place throughout the afternoon. Photo by Lee Choo. 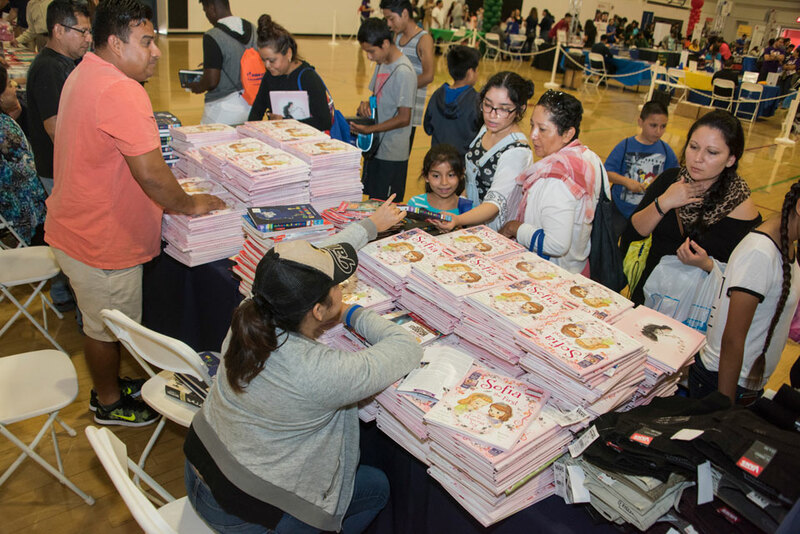 The Cónsul de México donated 30,000 books that were distributed to attendees at the event. Photo by Lee Choo. 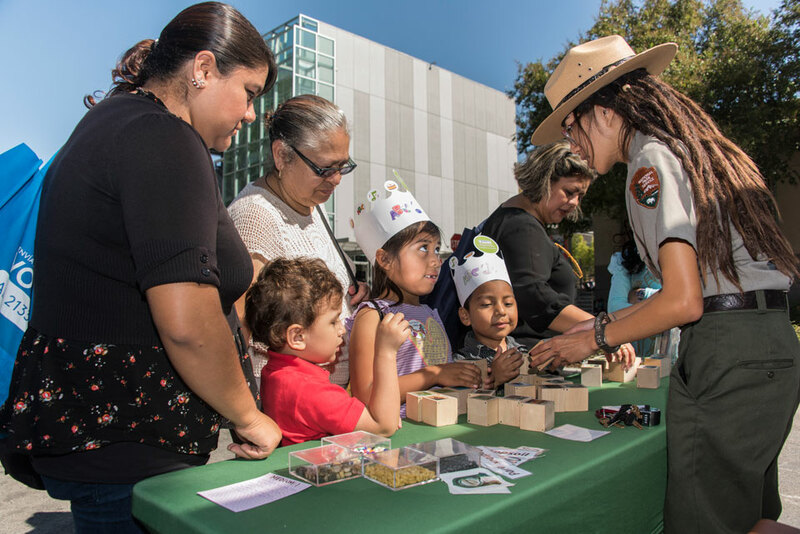 Young people learned about careers in national parks and forestry. Photo by Lee Choo. Workshops covered subjects like financial aid, college application preparation and careers with degrees in majors like Chicana/o Studies. Photo by Lee Choo. Parents accompanied their children to workshops to learn more about progressing to college. Photo by Luis Garcia. 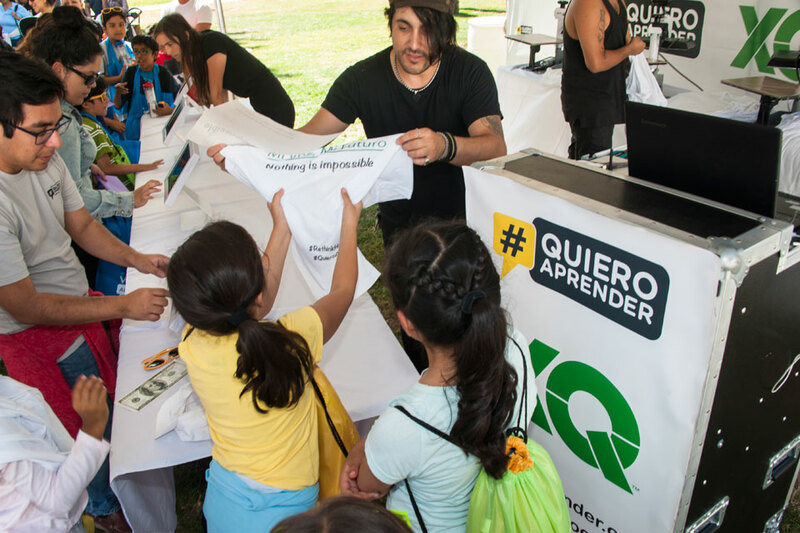 Among the many education-oriented giveaways distributed at the event, these youngsters received T-shirts with the inspirational hashtag #quieroaprender. Photo by Luis Garcia. Maria del Rocio Gomez-Uñiga returned to the United States from her native Mexico two months ago with aspirations for her three sons. She wants them to grow up and become educated so that they can someday realize dreams of their own. Yet, like many parents in the Latino community, she found that she did not have a road map to college success. With English being her second language, she found it challenging to know what questions to ask or how to guide her children on a path to higher education. It is for families like Gomez-Uñiga’s that Feria de Educación was created. A partnership between Univision and the California State University system that began in 2008, Feria de Educación came to the campus of California State University, Northridge for the first time on Oct. 15 to help Latino families learn more about education, so that young people can see a college education as something that is attainable. 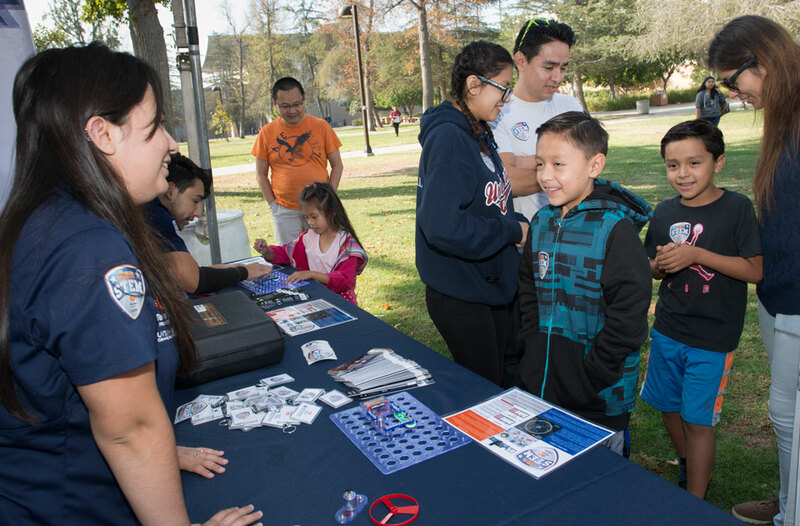 The event kicked off on the steps of Oviatt Library, with CSUN President Dianne F. Harrison and officials from Univision, the CSU Chancellor’s Office and Cónsul de México welcoming attendees, who then went to information and activity stations and workshops that were located throughout the campus. Families were encouraged to tour the campus to get a feel for what could lie ahead for their children. The workshops included how to prepare college applications, the various financial aid options available, as well as information on primary education so that young people are more prepared for college. 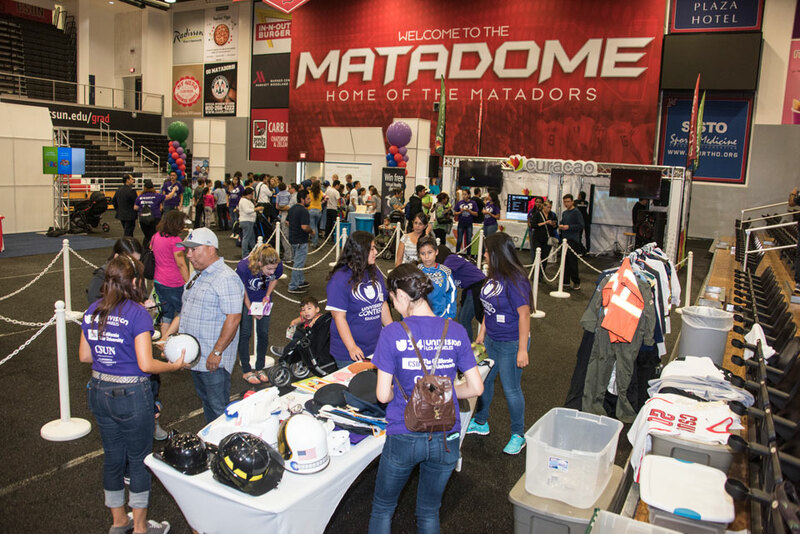 The Matadome floor was broken out into sections where young people could get books, receive information about college and even dress up and take pictures as a police officer, doctor or whatever career they might aspire to be. The goal was to educate these families so their children are more prepared and not intimidated by college. 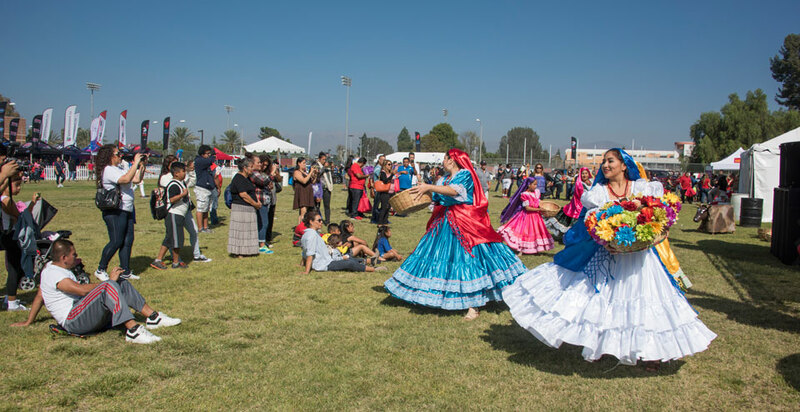 Having CSUN host this event for the first time was important to the university and its mission to serve the community, especially the East San Fernando Valley, which has a high concentration of Latino families. Also, the campus’ size and resources made it a great home for the thousands who attended the event. CSUN’s location also made it easier to access for families that came from the Antelope Valley, Los Angeles and some even further areas. The CSUN-hosted Feria is the second in a series of three events taking place on CSU campuses across the state. Luis Patiño, vice president and general manager for Univision, talked about the original goal of Feria de Educación as providing young people the information and resources to reach for a college education. 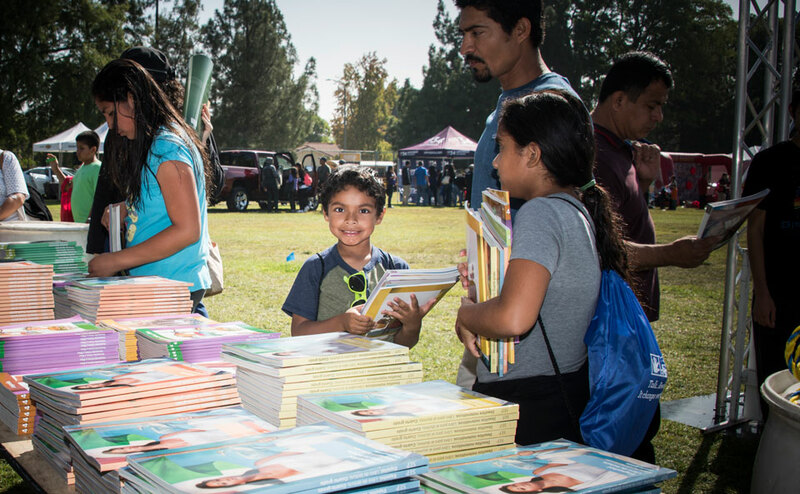 The Consul de México made a donation of 30,000 books that were distributed to the families who were in attendance at the event. Encouraging these families to read, in English and in Spanish, was the goal, with the hope that these young people continue to thirst for learning. Gilberto Luna Moisés, the cónsul adscrito for the Cónsul de México of Los Angeles, stressed the importance of education for the 55 million Latinos living in the U.S. He pointed out that one in five college-age people in this country are Latino, yet only one out of 10 college students nationally are Latino. 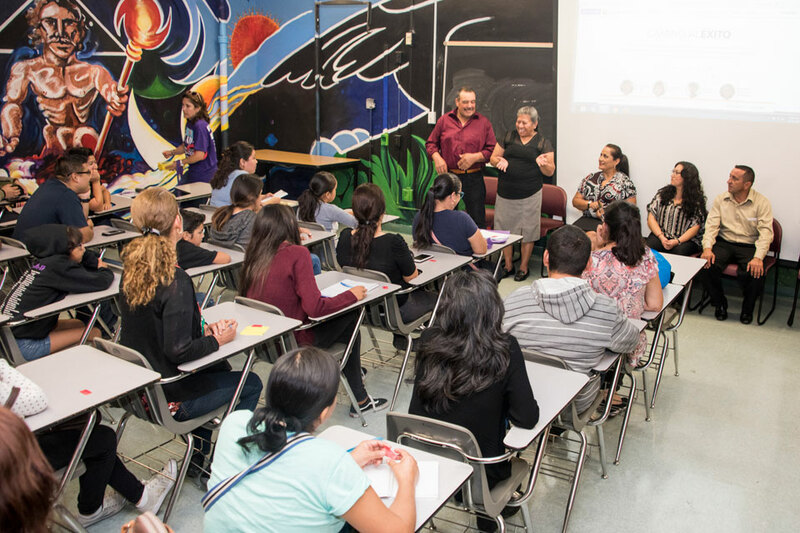 Feria de Educación is working to change that, and it has become a model for the other nine Cónsuls de México throughout California. Many elementary school-age children were in attendance with their families, which helps to plant the seed early for aspiring to college. A reading room in the Matadome saw many adults reading to young people, encouraging them to expand their knowledge and horizons. CSUN Vice President of Student Affairs and Dean of Students William Watkins sat with a group of children and read to them. Watkins said these types of events could have a long-lasting impact on these young people. Gomez-Uñiga is one of these forward-thinking parents. She sees a day when her children attend and graduate college. It was through Feria de Educación that she saw that path to college open up.